Boon’s super quirky bottle drying rack isn’t just incredibly fun to look at, but also incredibly practical. From bottles, to bowls to pacifiers, this garden themed rack is perfect for hygienically air-drying all the baby accessories you can imagine. Water drains into the lower tray, while the flexible grass-like blades on top hold the items upright. If you want to go all out cute on this one, pick up Boon’s matching butterfly accessory that makes for more drying space, or you can pick up their matching silicone flower bottle cleaning brush. Perfect for any sleep-deprived parent, this cute little whale creates the ideal environment to quickly send any newborn off to sleep. The SoundSpa slumber whale comes with 7 soft sound settings such as white noise, ocean waves and heartbeat as well as projecting 3 calming ocean themed images to keep baby stress-free when trying to wind-down. Small enough to travel with you, this product really is worth the money and will last through the toddler years too. Juggling a slippery baby, when you’re already nervous enough about how teeny-tiny your newborn is, can make for a stressful bath time. This is where Blooming Bath flower can solve any new-parent problems. Handmade from super-soft plush materials, the petals conform to any sink or baby-bath to support and protect the baby. With Blooming Bath, mums and dads can enjoy a stress-free bath time; safe in the knowledge that baby is comfortable and visually stimulated. This product is genius! Providing peace of mind to any parent, the Gro-Egg changes colour to help parents maintain the perfect temperature for a safe sleeping setting. A blue glow suggests the room is too cold, a red glow means the room is too warm, and a yellow glow lets the parents know the room is just right. 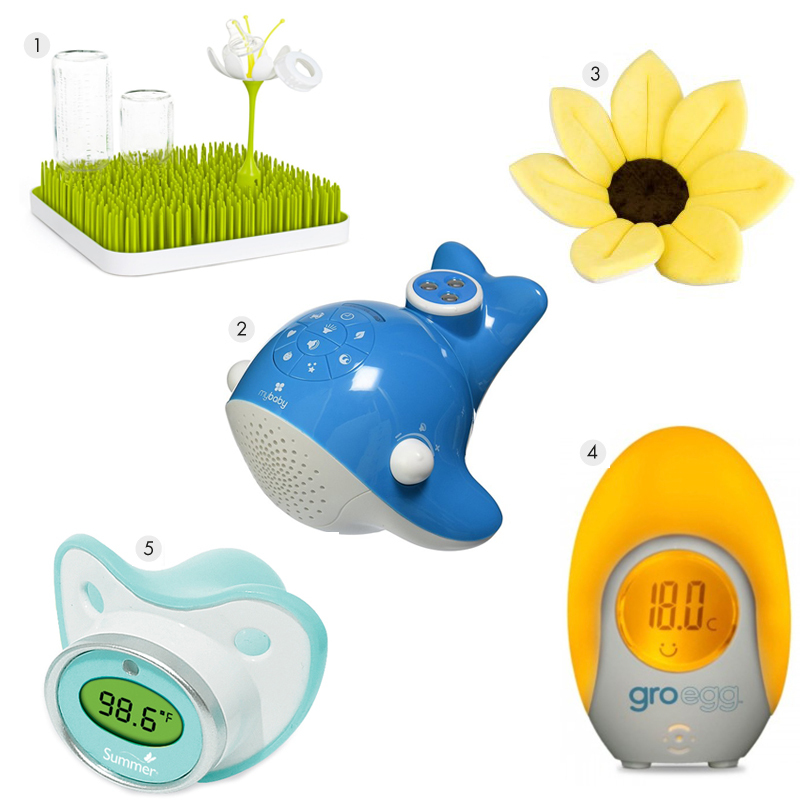 The changing colours means the Gro-Egg works great as a night-light too! The Gro-Egg also comes with a number of attachments to transform the light into cute little animals such as an owl or a penguin. Another great product from this company, which is great for kids a little older, is the Gro-Clock, which uses back-lit images of the sun and the stars to let children know when to go back to sleep and when it’s okay to get up. Similar to the Gro-Egg, this product is a great 2-in-1, combining a pacifier to keep baby calm and a thermometer to keep baby safe. Although there are a number of very similar products on the market right now, what we love about Summer’s is its convenient ‘Fever Alert’ colour changing glow which allows parents to see at a glance if something is wrong. Just like Gro-Egg, red alerts parents that baby’s temperature is too high, and green means everything is okay – the backlit screen allows parents to take a night-time temperature without having to disturb baby.